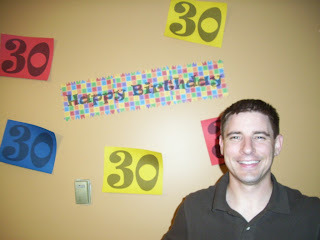 In August we celebrated Kevin's big 3-0! Many of you already know this because you were a part of it! For his birthday I contacted several people from Kevin's present and past and invited them all to send birthday cards to him. We were so impressed by the turnout! 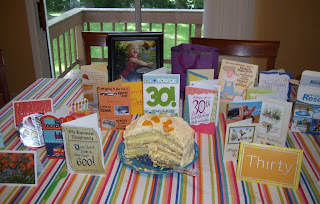 Kevin received almost 50 cards from all over the country from very special family and friends. (Moyers-I owe you a special thank you for your help in spreading the news of this request!) Kevin was so touched by the show of caring and love he received. Thank you all who participated! 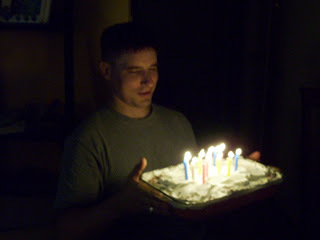 We also threw a birthday party which Kevin grilled for. Apparently the word has gotten out about his grilling because our house was filled to overflowing! 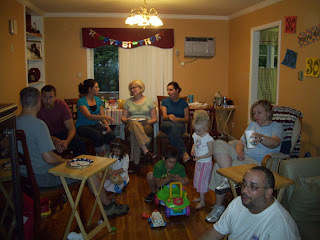 We exceeded all previous records of how many people could be in our house at the same time. 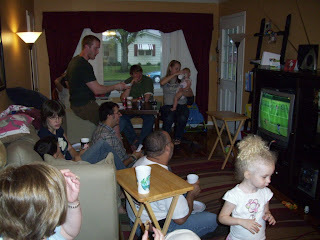 Of course contributing to that was the rain, requiring everyone to stay in our living room! What fun chaos! 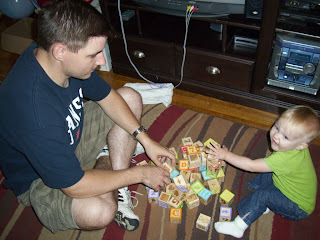 And of course as time marches on, Avery just keeps growing and growing... She was really into blocks for awhile. Setting them up was great, but knocking them down was even better! Her patience and carefulness to set them up surprised even us. 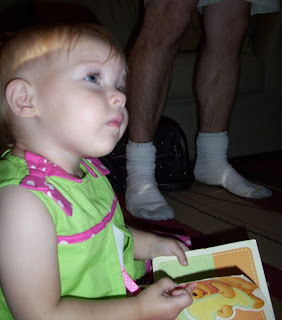 These are her not-so-staged 14 month old photos. As you can see I dressed her for the photos, but then forgot to take them until the end of the day as she is watching us play the Wii and trying to figure out how to get involved. 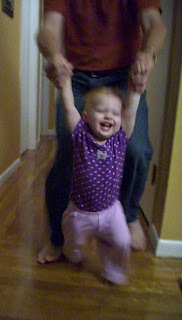 Last is a photo of a common sight in our house, Daddy causing Avery to be at the very height of joy. She always looks forward to him coming home because it often means chases and tickles and a playmate in ways Mommy just can't match. It is a very special relationship to witness. Love that Kevin guy of yours!!! 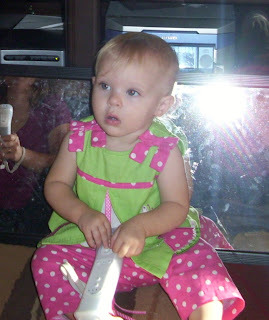 Avery rules our heart with every post! This update is just wonderful. Such precious pictures. However, Tonya we love you and want to see your beautiful face more oftern. "243"